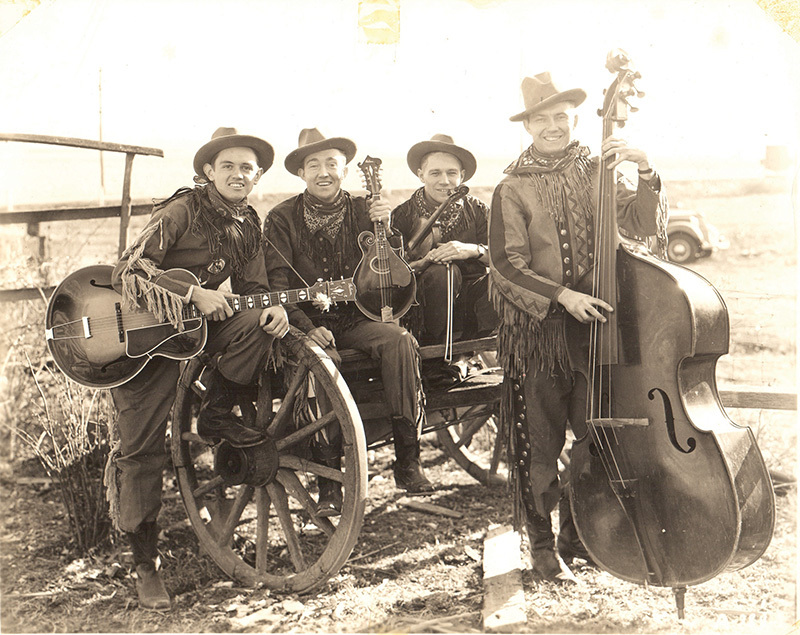 The Drifting Pioneers was a four-man country music group that was nationally prominent in the 1930s and 1940s. Three of the four members of the group were from White County, Ill. The Drifting pioneers consisted of brothers Walter and William “Bill” Brown from Springerton, Morris Wayne “Sleepy” Marlin who was raised between Maunie and Herald, and Merle Travis from Muhlenberg County, Ky.
Walter Brown played the mandolin, sang tenor solos, and was the emcee of the group. Bill Brown played the bass violin (bass fiddle), and sang baritone vocals. Morris “Sleepy” Marlin played the fiddle and did vocal solos. Merle Travis played the guitar as well as singing and writing songs. The Drifting Pioneers began as Walter and Bill Brown along with Ralph Lasater, who played the fiddle. They started playing as a trio act in 1935 or 1936. Clyde Brown, father of Walter and Bill Brown, played with this group for awhile in the 1930s. He would sing as the lead singer. Walter and Bill Brown started out picking out tunes in Jesse Rockett’s Drug Store just off Main Street in Springerton. Jesse Rockett was the father of Jim Rocket, now of Enfield. Jim Rockett is a good guitarist in his own right and used to listen to them play in his father’s drug store. Jim is younger than the Brown brothers. Jim Rockett, Ralph Lasater, and the Browns would listen to WLW Radio Station which broadcast the Boone County Jamboree live from a Cincinnati, Ohio theater. WLW Radio Station had 50,000 watts of power and could be heard nationwide and in Canada and Mexico. Somewhere around 1936, the Drifting Pioneers were scheduled to play at the Hamilton County Fair in McLeansboro. Ralph Lasater couldn’t go, and they needed a fiddle player. There they met “Sleepy” Marlin. “Sleepy” was scheduled to play at the fair as a solo act. “Sleepy” offered to fill in for Ralph Lasater as their fiddle player. They played together at the fair and hit it off immediately. Within a year this trio landed a job at WGBF Radio in Evansville, Ind., where they met Merle Travis who played “Tiger Rag” on the station. He was 18 years old at that time. Merle Travis played with the Tennessee Tomcats and later with Clayton McMichen’s Georgia Wildcats. McMichen ran into some difficulties. Merle Travis was out of work when he met the Brown Brothers and “Sleepy” Marlin. Merle is reportedly to have told them he needed a job because he had a wife, a child, less than a dollar in his pocket, and one-half of a box of oatmeal to feed them. The four of them went to Cincinnati to WLW and they began playing impromptu in the lobby of WLW. The program director heard them and hired them on the spot to play on WLW. The four-piece Drifting Pioneers played for five years on WLW Radio on the nation’s No. 1 radio station and its No. 1 show, the Boone County Jamboree. After that, they took their show “on the road.” They were very well known at the time and were making $40 a week each when the average wage at the time was $1 a day. The Drifting Pioneers even had their own 55-page song book published in 1939. 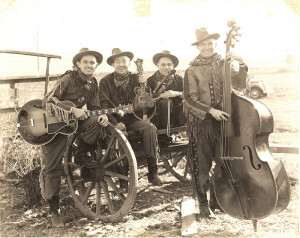 In 1941 it was written that when the Drifting Pioneers was introduced on WLW Radio, it was announced that “You’re bound to hear fiddlin’, guitar pickin’, or old fashioned singing in true southern style.” They sang as a quartet, and it is said their renditions of hymns, gospel songs, and spirituals were hard to top. When Japan bombed Pearl Harbor on Dec. 7, 1941, Walter Brown, “Sleepy” Marlin, and Merle Travis all volunteered for the service. They were not accepted. Later, “Sleepy” Marlin became a flight instructor and spent World War II training pilots. Bill Brown, who hadn’t volunteered, was drafted before the end of World War II and spent the post-war years as part of the occupation forces in Berlin. The war broke up the group. Bill Brown wrote songs for the rest of his life, mostly gospel standards for Pentecostal churches. Bill and his wife moved around a lot; she worked as a maid and he worked as a butler. He was living in New Mexico when he died. Walter Brown returned home to White County. He worked at various jobs; as well as operating a grocery store in Springerton, where he allowed the local people to charge their groceries on credit. He also held some political offices and eventually was the Superintendent of Public Aid for White County for a number of years. Walter Brown died in 1984. Morris Wayne “Sleepy” Marlin started playing the fiddle at the age of 11 by imitating other fiddlers. He won his first fiddlers contest at age 18. He won National Fiddling Championships 7 times in the United States and Canadian Championships, 10 times. He performed on Louisville radio station WHAS and the television show “Hayloft Hoedown” from 1950-1962. He also appeared on national network television shows including the Arthur Godfrey Show, Renfro Valley Barndance, Your Town with Faye Emerson, the Dave Garroway Show, WLS National Barndance, and Garry Moore’s To Tell the Truth. He also performed on the 60-plus station national Canadian CBC network. He continued performing with his six sons and a daughter until he retired in 1988. They performed often, starting in 1954, with the station house band Louisville, Ky. Radio Station WHAS. He performed and worked with some of the top old-time musicians. Born Aug. 7, 1915, in White County, Ill., he died Jan. 20, 2011, at age 95, in Jeffersonville, Ind., across the river from Louisville, Ky.
Merle Robert Travis was born in Muhlenberg County, Ky, the son of a coal miner, on Nov. 9, 1917. “Travis picking”, a style of finger picking a guitar, is named after him. His design for a solid body electric guitar, built for him with a single row of tuners by Paul Bigsby, inspired Leo Fender’s design of the Travis-Bigsby guitar which now resides in the Country Music Hall of Fame Museum. Among the many songs he wrote were “Sixteen Tons”, “Re-Enlistment Blues”, “Dark as a Dungeon”, “Nine Pound Hammer”, “So Round, So Firm, So Fully Packed” and “Smoke, Smoke, Smoke (That Cigarette).” He played with Grandpa Jones and the Delmore Brothers in a gospel group called “The Brown’s Ferry Four.” He later landed bit parts and singing roles in several “B” western movies in Hollywood. He was inducted into the Nashville Songwriters Hall of Fame in 1970 and elected to the Country Music Hall of Fame in 1977. Merle Travis died of a heart attack on Oct. 20, 1983. I wish to thank Jim Rockett of Enfield for sharing his collection of information and pictures of the Drifting Pioneers with me, as well as a copy of an interview by Braden Willis about the three White County members of the Drifting Pioneers that he conducted in 2008 with family members. If anyone has any information about or pictures of the Villagers’ Voice area to share with the readers of these articles, please contact me at Edward Oliver, P. O. Box 456, Norris City, IL 62869, telephone me at 618-378-3176, or email me at edoliver2@yahoo.com.